he relies on materials and artisans from Senegal to produce the drums he sells. David brings excellence to every drum he supplies. Each and every one is handmade. No assembly lines. No factories. A drum is a treasured musical instrument; excellence legitimizes it. It starts when David connects with his contacts back in Senegal. Over decades, he has assembled an informal "co-op" of highly skilled people thanks to whom he can continue to supply sculpted drums of all sizes, shapes and proportions. Once the specifications are set, the order goes out. Always, the preferred wood is mahogany. The drum body will be sculpted from single-piece wood by expert craftsmen in Africa. Their tools are few - three adzes of different lengths and angles, a file and pumice or sandpaper. In the photo gallery below, note the symmetry, the consistent proportions and the perfect circular shape of the bowls of the partial drums. The handiwork is nothing less than prowess. No laminates. No glue. Only long-developed skill. The detail on the outside of the body varies. Some will have decorative carvings, others may have intricate finishings, and some may have both. The auxiliary pieces, including skins (goat or other, depending on the drum family), pegs and rope, are also imported from Africa. "I like to think of myself as a 'drum luthier'. 'Luthiers' were craftsmen who built lutes, famous in their time, as were craftsmen who made fine violins. Drums are fine musical instruments also. They need expert loving care as much as Stradivarius gave to his violins. I learned early on about the physics of sound from animal skins, and how it relates to the air chambers in the drum body. I spent years experimenting with different designs, proportions, kinds of wood and kinds of skins. I taught myself to tune the djembe (I improved the Mali weave), and I taught myself to tune the sabar (replaced pegs with lugs). I don't think anyone had tuned them before. ​When the materials arrive in Canada, David takes over personally. He finishes the drum body, cleans and shaves the skin, and attaches the skin to the body with pegs or rope or both. The final step is to tune the drum by weaving and tightening the rope to the desired tension. Aesthetics are not forgotten. The ropes are colourful and braided into intricate, matching patterns. The end result is a fine instrument with years of life. ​A well-built drum can have a lifespan of twenty years or more. However, the skins sometimes break and need replacing due to climate change or simple wear and tear, or weaker drums made elsewhere may crack, or the ropes may weaken which causes the drum to need tuning. David will repair and refresh drums. Long-distance customers ship their drums to him by courier and he returns them by courier when they are ready. The sabar drum family is found only in Senegal. Sabars are sometimes played by 200 to 300 players at the same time. Sabar is the descendant of the highly-difficult drum family called Kutiro. The sabar has been made famous by many Senegalese musicians through performances, workshops and shows abroad, but none more well-known than the legendary sabar master Doudou Ndiaye Rose (July 28, 1930 - August 19, 2015. RIP). Sabar is beyond a doubt the most compatible drum with many of the world's musical styles. It is instantly recognizable. One hand and one stick in ensemble provide many different pitches. Sabar has special affinity with Celtic music and the Banshee Reel from New Zealand. The djembe is an extremely versatile instrument. The hourglass shape is familiar. 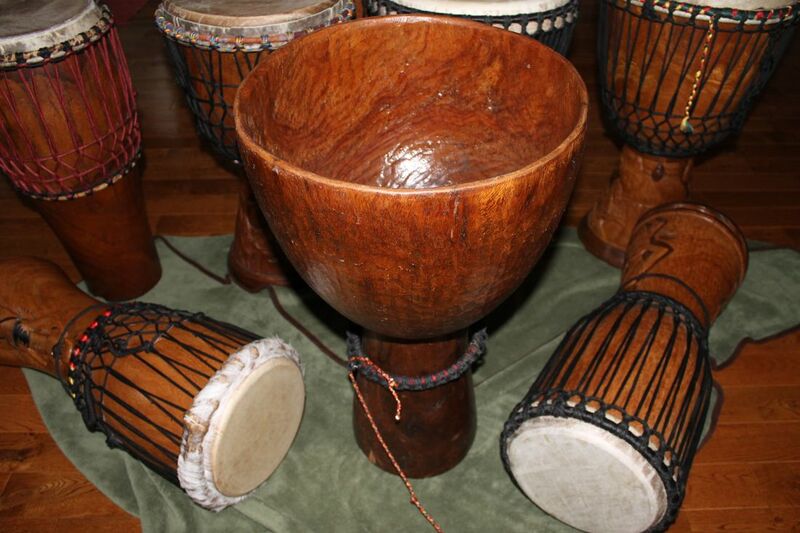 The ideal proportion of a djembe is equality between the length of the bowl and the length of the stem (also called the neck). Djembe has three tones - bass, slap and tone. David supplies many djembes. At last count, his djembes could be found in 38 countries. Lamba often holds the beat of the orchestra with its mellow tone. Lamba has a solid bottom and so is a heavy drum. Besides sabar, djembe and lamba, David will supply virtually any West African drum including mbeng, kenkeni, sengba, tama, dunumba (djun djun), kutiro, kutiri ding, mder, kirin (log drum) or tungune. They vary in difficulty in carving and production. Copyright © 2018 David Thiaw, Domba Productions.